Mostly users login to their accounts in invisible mode so no one can see their status. Nowadays every chat messaging service providers have featured their users with this option. This feature is quite interesting for those people who want to be available (online) yet appear offline status. However this is annoying for those who want to chat when they login to their account and come online. However there is option to find out invisible MSN messenger users instantly in MSN messenger or Windows Live Messenger using MSN Status Checker. Since Microsoft has disabled the feature to trace out the offline/invisible/ blocked user’s status using third party application services. 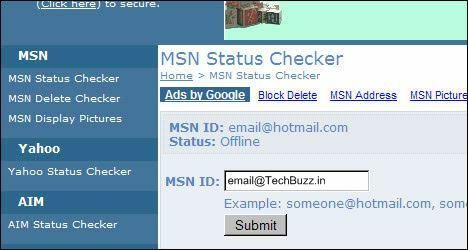 Nevertheless you can use MSN Status Checker utility online tool, which displays users from your list who are currently online in invisible mode. It is completely free online tool to check MSN users status. You need to enter your friend ID and press the Enter button. MSN Status Checker finds out status of your friend and shows you report within seconds. Few times it shows incorrect results due to inability to get access user’s account database. One more thing to know that this tool will not work in case user has selected this option from setting menu “only people in my list can see my status and send me messages”.